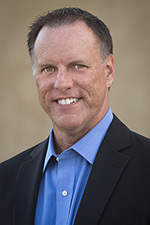 Configure DirectAccess with OTP Authentication | Richard M. Hicks Consulting, Inc.
A question regarding “DirectAccessOTP Logon” certificate template. I noticed that you mentioned: if the CA is running Windows Server 2008 R2, the template must be configured to use a Renewal Period of 1 or 2 hours and a Validity Period that is longer but no more than 4 hours. also in your configuration, you set the ” Validity Period ” to be 1 hour, so is that mean every hour the end user has to enter his or her OTP again? In our Lab environment, we have server 2008 R2 as CA, and we cannot extend the ” Validity Period ” to be more than 4 hours, if I do, OTP will break. 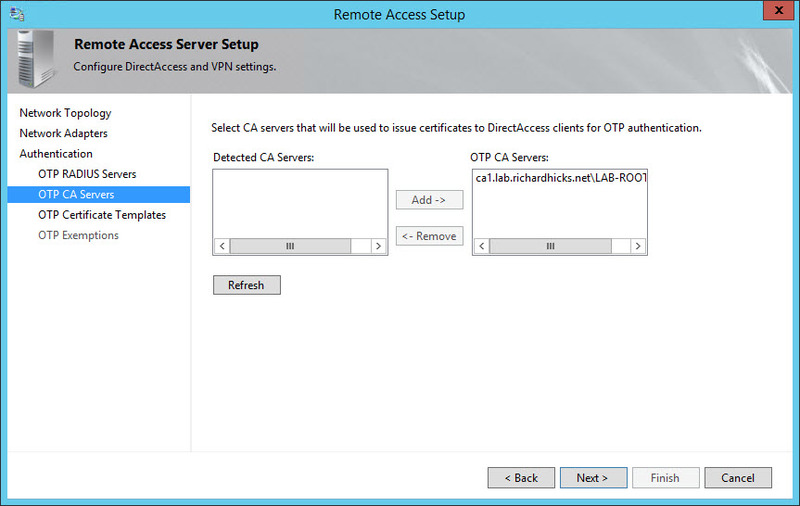 so if we use server 2012 R2 as our CA, does this restriction still apply? The user will not be required to enter their OTP every hour. The certificate will be automatically renewed as long as the user’s logged on session is still valid. Also, I’ve never tested with anything other than a 2012R2 CA. However, 2008R2 should work, just set the validity period to 4 hours and you should be fine. Also we noticed the GUI broken problem, Microsoft premier engineer said it has been reported as a “bug”. Do we have any ETA on when this hotfix will be released? It’s been a known issue for quite some time. I’ve not seen any indication that an update is available to fix it yet. If that changes I’ll post something on the blog for sure. Hi. What RADIUS server we can use? Can we use as OTP password which is send to Phone as SMS? Any RADIUS server should work, as long as it doesn’t require challenge/response. Should work just fine with SMS tokens too. We have encountered OTP user experience issues since Day 1 of the lab deployment in our firm. We only have Windows 7 Ent client, and CA is running on Win 2008 R2. “DirectAccessOTP Logon” Validity Period set to be 4 hours, Renewal period to be 2 hours, however, all the DA client have to re-enter his or her OTP randomly during this 4 hours period. Then I forced to change the Validity Period to be 24 hours, Renewal period to be 2 hours, users still need to re-enter OTP randomly. [ this action does trigger the remote management console show Red on OTP], but it doesn’t prevent the DA user to authenticate against OTP. So I am wondering, it is not because the “Validity Period” or “Renewal period” made users to re-enter the OTP, it is something else…. Does the user has to constantly keep the session live by moving mouse and keyboard? The user experience is decidedly degraded when using OTP, and especially so with Windows 7 clients. In my experience, Windows 7 clients don’t maintain their IPsec tunnels as long as Windows 8 clients do. When the tunnel goes down, the user will be forced to authenticate again when they reestablish. I’ve never tried changing the validity or renewal periods on the certificate template, to be honest. From your experience it sounds like it breaks things. I’m not sure there’s a workaround. We have no plan to migrate to Windows 8.1, at least in the near future. Most likely we will go for Windows 10 directly. Also, is there way to find the OTP certificate on DA client machine? Usually we can view the certificate from MMC console, add snap-in, and go to Computer > Personal > Certificates, for example we can view NAP health certificate from here. but where do we find the OTP certificate on client? I’m not certain, but perhaps it is located in the user’s personal certificate store? I checked in user’s personal certificate store, it is not there. Many thanks for this excellent post and for all the info you are sharing. Any plan to publish configuration info on the integration of smart cards with DirectAccess ? I’ve considered it, but I don’t currently have a test machine with a suitable TPM. If that changes I will probably author something on the subject as it isn’t very well documented at the moment. With the statement “In addition, enabling OTP with DirectAccess disables the use of null cipher suites for IP-HTTPS. ” – I can’t see anything on the Microsoft site that details this. How do you see/confirm if this is the case? Detailed documentation on DirectAccess is difficult to find on the Microsoft web site, unfortunately. I have confirmed this behavior by observing network traffic on the client and server in each deployment scenario. I’m not sure. I’ve only ever done this using a Windows Server 2012 R2 PKI. Event ID 10004. Our windows 7 and 8 clients are working fine but windows 10 will not. I tested it and it did work with earlier preview builds, but I have not yet tested with RTM. Hopefully they didn’t introduce a bug! I am currently testing OTP with Windows 10, still haven’t got it working. It might be related to the usage of RSA SecurID, not sure yet, still figuring this out. However, what I have noticed so far, the user doesn’t get -any- notification from the Action Center automatically that an Action is Required from the user (OTP Password). This is not really user-friendly, the user is now obligated to open up the Action Center themselves to see why they are not getting fully connected! Interesting. I’d understood that Windows 10 was actually improved with regard to OTP notification. I haven’t yet tested myself though. Did you have to make any changes to your configuration to get Windows 10 clients to work? In the meantime I have got it working on Windows 8.x (with RSA). However, Windows 10 doesn’t like what we’re doing, it does show the OTP Logon box. But as soon as I logon using my RSA Token (which does work on Windows 8.x) it will give me an “Authentication failed due to an internal error 0x80040002” message in the OTP Logon box and in the Event Log I can see the following error “A certificate for OTP authentication cannot be created. Error code: 0x80040002”. I get the exact same error on Windows 7, the only client that does accept this configuration is Windows 8.x. Interesting. I have to suspect something is up with the RSA configuration then. Typically OTP authentication will work for all or none. Not sure why it is being selective for you. I find that hard to believe since the authentication method is basically the same and in all cases should be delegated through the DirectAccess Server(s). My guess is as good as yours, in my opinion it should work equally the same on all Operating Systems. I have absolutely no clue why it works on Windows 8.x and not on Windows 7 or 10. Agreed. I haven’t had time to thoroughly test this myself yet. When I do I’ll be sure to share the results. I managed to fix the Windows 7 issue, funny enough it was actually an issue you’ve already written on your blog about (https://directaccess.richardhicks.com/2014/05/09/error-0x80040001-when-using-otp-on-windows-7-sp1-directaccess-clients/). As for Windows 10, still haven’t found a solution. The error I keep on getting is 0x80040002 when I enter my OTP credentials (which work fine on Windows 7/8.x). The error I see in the Event Log (OtpCredentialProvider) is “A certificate for OTP authentication cannot be created. Error code: 0x80040002”. Hi guys – I’ve got exactly the same issue here on Windows 10 clients. It was the same on RTM and I was hoping they’d fix it in the live release but it’s still the same. I’m working fine on Windows 7 / 8 and 8.1 but get the “A certificate for OTP authentication cannot be created. Error code: 0x80040002” message on 10 clients. Any one made any progess on this they’d be willing to share? We’re keen to get Surface Pro 3’s with 10 on them out there but this is holding us up. I still haven’t had time to test this yet. Sorry! I hope to get to it soon as I’ve had a number of people ask about this. Stay tuned! Not me on Windows 10 – still functioning very well on 7/8/8.1 – Just about to launch a support call with Microsoft. I’ll keep you guys posted. Just got off the phone to Microsoft – they are aware there is an issue with Windows 10 clients and 2 factor authentication and are working on a hotfix. No ETA though unfortunately. The Windows 10 2FA issue is a confirmed bug by Microsoft and a fix is coming. The issue will be fixed in the TH2 (Threshold 2) release of windows 10 that is due in November. We are still waiting for the product group to decide if it will be fixed in TH1 (current servicing build on windows 10). I suppose we have a common issue. Does DirectAccess OTP also support RSA SecurID tokens/radius servers as OTP method? 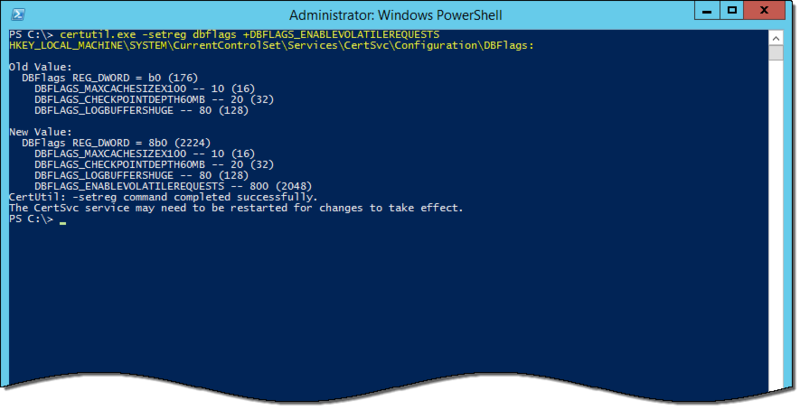 i try to follow as your guide, but when i access to window server through remote desktop it still not show OTP alert. could you help me to explain more detail about this task. If you follow the guidance in this post it should work. If not, I suspect you’ve missed something during the configuration. I’d suggest walking back through step-by-step to see what you’re missing. 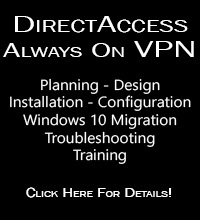 DirectAccess is an IPv6-only solution. It’s configured by default to use IPv4 on the internal network, but you have to use IPv6 on the client side. No way around that. can you give me the detail documentation for implementing on this task? i think you may have all detail document about DirectAccess OTP. if can please help to send me sir. Here is a link to the official Microsoft documentation for configuring DirectAccess with OTP authenticaiton: https://technet.microsoft.com/en-us/library/jj134229.aspx. OTP is definitely supported when using IP-HTTPS. That support statement has to do with terminating SSL/TLS on an external device when using OTP, which breaks OTP and is of course unsupported. I got directaccess configured and green with OTP thanks to this blog. When i connect a window 10: where and when do i need to enter OTP??? (totp in my case). I don’t know where and the radius doesn’t get any authentication request. Thanks anyway for the throughout articles! The end-user experience for OTP is not real great, unfortunately. There’s no immediately visible indicator that the user needs to provide their OTP credentials. They’ll have to click on their network connection and then click on the DirectAccess connection where they’ll see that action is needed. Alternatively, the user can press Window Key + I, click Network & Internet, and then select DirectAccess. Very odd. I’ve not encountered that myself, so I don’t have much to offer in the way of advice. Sorry! You might have to open a support case with Microsoft if you can’t get it sorted. I need many hours to find this issue. Thanks for the details, Thorsten. You bring up an excellent point here, one that I did not consider. However, my article was not meant to be a comprehensive deployment guide for PKI. Rather, it assumes that infrastructure prerequisites are in place to support smart card authentication. The guidance provided here is solely for the configuration of an existing PKI and DirectAccess for OTP authentication. However, I will update this post to reflect this important detail. Thank you for this realy interesting article, which helped me by my last Installation – just perfect. 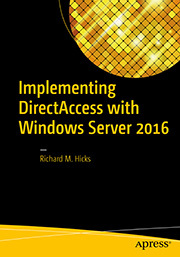 I also bought your book about DirectAccess to better understand all the different topics. The book is a big helper for many customer projects. I have configured OTP and have it working successfully. The only issue I seem to have is that Windows 10 clients seem to take around 10 seconds for the authentication to come through whereas Windows 7 auth is sent within a second to our phones. Is there any difference in the way the OS handles the OTP request? That’s odd. Fundamentally, Windows 7 and Windows 8.x/10 handle OTP much differently. Windows 7 uses the DCA, but Windows 8.x/10 it is integrated in to the operating system itself. I can only guess that has something to do with it, but I’m not certain. Hello, I recently deployed Windows 10 with DA using OTP. Our users receive several different Internal error message; is there a site that tell what each error message means? They are probably documented somewhere on the MSDN web site, but they are scattered around depending on which subsystem generates the code. I often use the Exchange Error Code Lookup Tool (err.exe) from Microsoft. It was created for Exchange, but it works for many common Windows error codes. You download it here: https://www.microsoft.com/en-us/download/details.aspx?id=985. In addition, you can find DirectAccess OTP troubleshooting guidance on the Microsoft web site here: https://docs.microsoft.com/en-us/windows-server/remote/remote-access/ras/otp/troubleshoot/troubleshooting-enabling-otp. Also, my good friend Benoit has a lot of experience with DirectAccess and OTP, and has documented much of it on his web site here: http://danstoncloud.com/simplebydesign/category/3631/. Hope that helps! Does anyone have a issue with next token mode on Windows 10/DirectAccess 2012. Issue: user enters RSA token, OPT tries to authentication but return message stating ‘Additional information required , please contact administrator’ or 0x80040001 error. Issue: User enters RSA token but there is a delay before it show connecting after the user clicks ok. user continue to click Ok and sometimes gets 0x80040001 error. Hi Toya. Neither new PIN or next token modes are supported with DirectAccess. Details here: https://docs.microsoft.com/en-us/windows-server/remote/remote-access/ras/otp/deploy-ra-otp#a-namebkmksoftasoftware-requirements. Hi Richard, first of all, this is a great guide! Thank You! We’ve followed your guide to the letter, but for some reason are unable to get it to work. 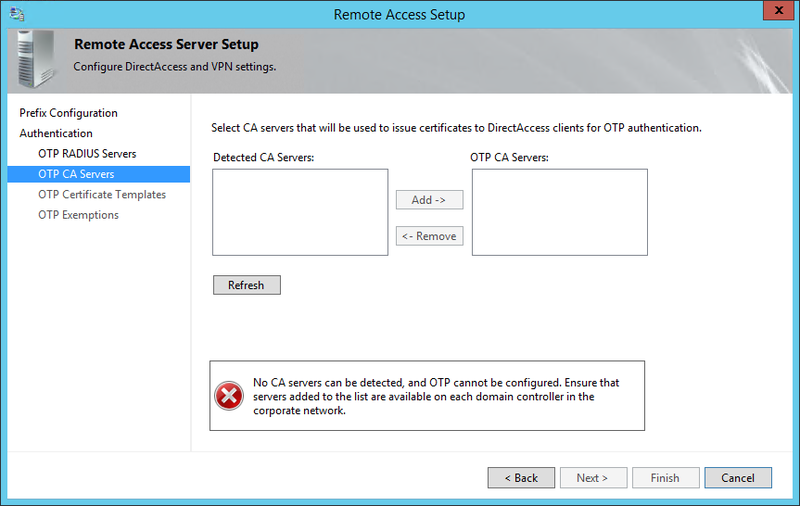 While OTP authentication succeeds, we receive an Event ID 53 on the CA “Active Directory Certificate Services denied request .. because The parameter is incorrect. 0x80070057…. Additional information: Denied by Policy Module”. We are using a 2K8R2 CA, and have followed the directions exactly. We see the Registration Authority certificate in the certificate store of the DA computer, so it should be used for signing the request that goes to the CA. We’ve followed every Microsoft article describing Event ID 53, and can’t seem to get it to work. That’s definitely unusual. That error code (0x80070057) seems to indicate a parameter error. Not a lot of help, I know. 😉 However, if your CA is denying the request, I’d look very closely at the configuration and security permissions to ensure you have it right. Other than that, you may end up having to open a support case with Microsoft to get the issue resolved. 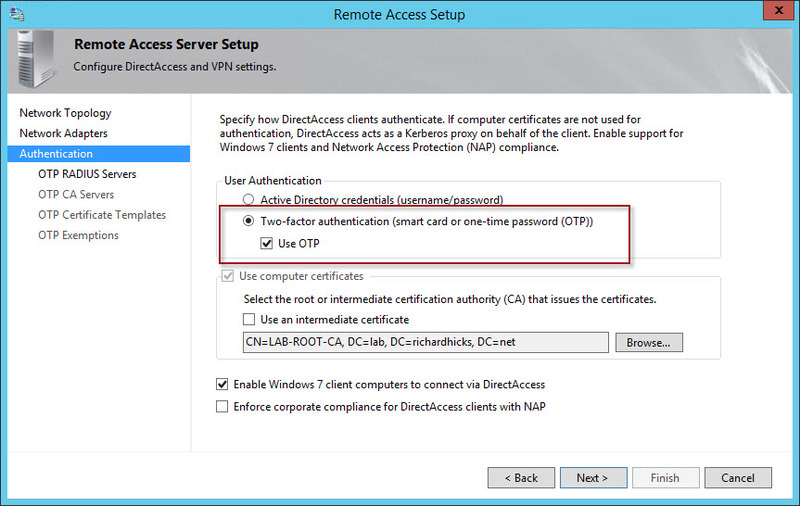 OTP Authentication with Remote Access server (servername) for user (domainuser) required a challenge from the user. I’m not sure what is causing that. Any ideas? No idea. I’ve never implemented RSA with Always On VPN. Correct. Definitely limits your options for MFA, for sure. Yup, the radius server was incorrectly configured on the RSA Appliance. I changed the .ini file on it so it does not require the challenge/response and it is working correctly now. Thanks! DirectAccess and Azure Multifactor Authentication | Richard M. Hicks Consulting, Inc.
Pointsharp MFA User Storage Configuration | Richard M. Hicks Consulting, Inc.